‘Opting out’ is when a staff member decides to leave your pension scheme within a month of being enrolled. Staff you’ve automatically enrolled and those who have opted in can choose to opt out. You must not actively encourage your staff to opt out (which could be considered an ‘inducement’). Any decision to opt out must be taken freely by your staff member without influence from you. Please refer to The Pensions Regulator Guide on Opting Out before proceeding further. Staff can’t opt out before the opt-out period starts or after it ends. If an employee chooses to leave the pension scheme after the opt-out period then they are not ‘opting-out’ but instead are ‘ceasing membership’ and would not normally receive a refund of their contributions. You should consult with the specific pension provider about how to proceed in such cases, as each scheme has its own rules. This guide gives details of how to deal with the opt-out process using Payroll Manager. 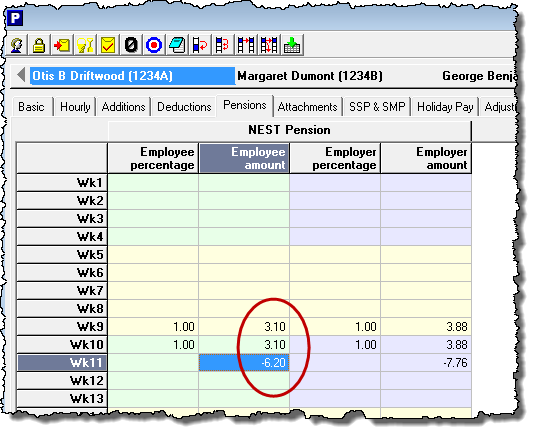 Click ‘Employees’ then ‘Employee Details’ and click on the ‘Auto-Enrolment pensions’ tab. Click ‘Yes’ to remove these contributions. Go to the ‘Pay Details’ screen and click on the ‘Pensions’ tab. 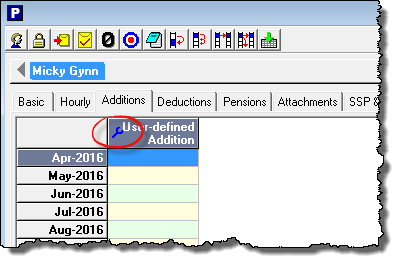 Add up the employee contributions column to determine the total amount that the employee has contributed to the pension scheme then enter this total as a negative figure in the next pay period * for that employee. The employee will receive this amount as a refund on their next pay day. You should repeat this procedure for any Employer contributions that have been made for this employee. * IMPORTANT The ‘Next Pay Period’ must be in the same tax year which pension deductions were originally made. If the employee opts out following the end of the tax year then please see the further advice at the end of this guide. What happens when a pension contribution is made in one tax year but the refund is due in the next year? Unfortunately HMRC validation rules for RTI do not allow the reporting of negative year to date pension contributions. This HMRC rule conflicts directly with the rule regarding pension contribution refunds when an employee opts out. E.g. A monthly paid employee is automatically enrolled in March, and has pension contributions deducted in the March payroll. In April the employee informs the employer that they wish to opt out, and are therefore entitled to a refund of pension contributions deducted from their pay in March. If the employer enters the refund in April HMRC will reject the associated FPS return as the year to date pension contribution will be negative and so fails HMRC validation rules. Open the payroll file for the previous year. Unlock the final pay period and process the refund in that period. Reprint the employee’s payslip and arrange to make the necessary payments to that employee. File a Year to Date Amendment FPS to HMRC (see our YTDA-FPS guide for details of how to do this). 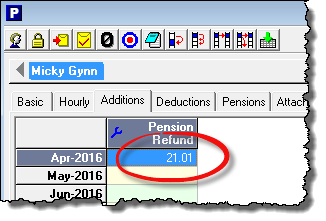 Or: You can enter the refund in the new tax year by creating a new ‘Addition’ column on the ‘Pay Details’ screen. Click on the ‘Additions’ tab on the Pay Details screen and then click on the ‘blue spanner symbol’ in any of the column headings. Create a new column by ticking the ‘Used’ box on the left hand side and then adding a suitable Description (e.g. ‘Pension refund’). You must then set the correct tax treatment for the pension refund by either ticking or unticking the ‘Taxable’ box. For pension schemes that operate a ‘relief at source’ method of tax relief (e.g. NEST) you should leave the taxable box un-ticked. For pension schemes that use the ‘net pay arrangement’ (e.g. NOW: Pensions) you should tick the taxable box. 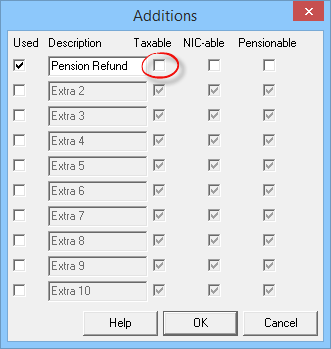 (Click ‘Pensions’ then ‘Pension Scheme Details’ to check which method your particular scheme uses). Leave the ‘NIC-able’ and ‘Pensionable’ boxes ‘un-ticked’. Enter the amount of the refund into the column that you have just created. The refund will show on the employee payslip for that period.